We didn't take our usual trip to Vail this year. In fact, we hadn't really gone anywhere in the last year farther away than a day trip to the Garden Of The Gods back in January. Mr. LH had also been spending his summer weekdays teaching extra classes and most Saturdays TAKING a couple courses. It was time to get away from everything for a bit. We managed to carve out a couple of back to back days for our trip and planned it around two destinations fairly close to each other...The Great Sand Dunes and the small town of Westcliffe. Mr. LH had been itching to take everyone to the Great Sand Dunes. He visited it as a child and was impressed by it. Now he wanted to share it with the "Pickles". 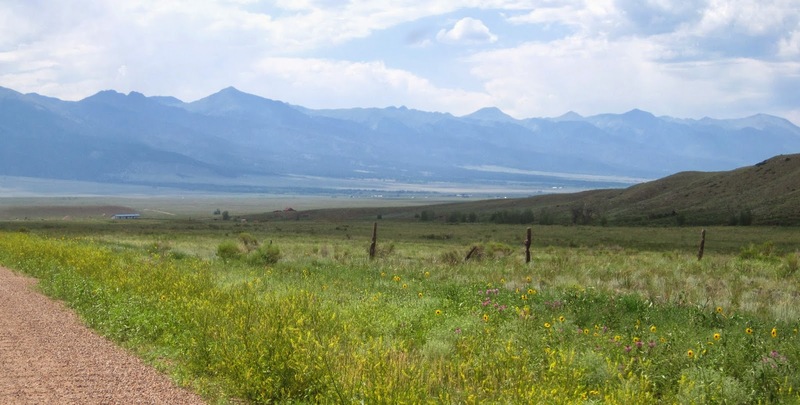 I was focused in on Westcliffe, a small town in the middle of nowhere. It was a place we wanted to scope out as a possible place to live someday. Mr. LH had a class to attend Saturday morning so it was late afternoon when we finally headed out for our quickie "vacation". The trip through Central and Southern Colorado was eye opening. The land changed so drastically from one city to the next. South of Pueblo, we stopped at a nice rest area to stretch our legs and see just how much farther we had to go (turns out it was a lot farther). The irrigated lawns and all the trees made for a nice photo op. I tried to show it in this photo, but you can see lush green grass everywhere the sprinklers are watering, but beyond the sprinklers, the un-irrigated areas are scrubby, brown and dry. We saw these wind turbines under construction along the highway. When we finally turned off the highway south of Pueblo and headed west, the views became some of the most breathtaking we had ever seen since we moved to this state. I spent most of the drive taking photos and video out the windows. It seemed so odd to be this close to the tree line. I read somewhere the tree line in the Wet Mountains is at about 11,500 feet. The sun was setting and skies turned a brilliant orange. A home in the San Luis Valley near Alamosa. We had reservations at the Super 8 in Alamosa and pulled in the parking lot long after dark. It was fairly inexpensive compared to other hotels in the area. The hotel could certainly use some updating, but we were happy to see the staff was very friendly and helpful and our room was clean and large and had a microwave and mini fridge provided. We unpacked and heated our dinner of grilled burgers (brought from home) and enjoyed a little bit of cable tv before everyone fell promptly asleep. The complimentary breakfast at the hotel was great! They had the usual pastries, toast, cereal and oatmeal and fruit selection, but they also had eggs, sausage and waffles (not toaster waffles - they're the kind you make yourselves). We filled up in anticipation of a long, calorie-sucking day. Our first order of business was to get our sand sled to use at the Great Sand Dunes. We had made reservations and pre-paid online through Kristi Mountain Sports. The price was very reasonable ($18 for the adult-sized sand sled). Since Kristi's isn't open on Sunday (when we needed the sled) we were to pick up and drop off the sled at the Alamosa Welcome Center in town. The Welcome Center is located in the historic Alamosa Train Depot. 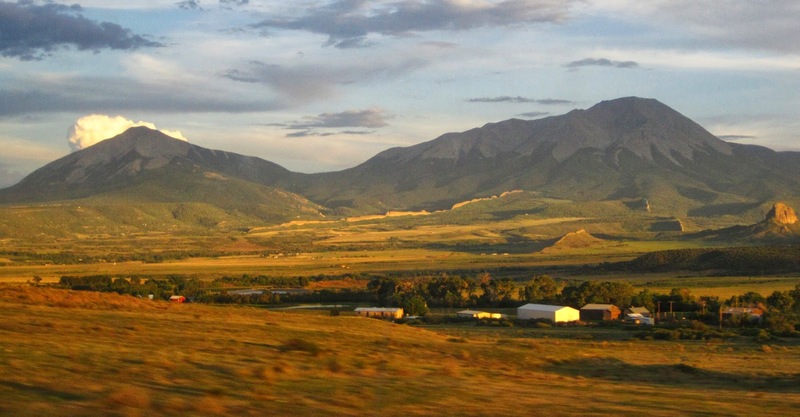 In fact, the Rio Grande Scenic Railroad departs from here to take you to La Veta (you can purchase tickets online). Once we picked up our sand sled, we turned east out of Alamosa and headed toward the Great Sand Dunes National Park. It seemed to take awhile to get from Alamosa to The Great Sand Dunes. It could be because the land was so flat, we could see the dunes long before we reached them. We had a wonderful time at the dunes! Read more about our trip to the Great Sand Dunes. Afterwards, hot, tired and needing desperately to cool off, we hopped into the van and turned on the seldom-used AC. Instead of heading straight back to the hotel, we turned north on 17 and headed toward the unincorporated community of Mosca CO, home of the Colorado Gators Reptile Park. The reptile park is another of those places we discovered online. (I believe it was the image of gators basking in the sun while laying on the snow that caught Mr. LH's attention. )Colorado Gators Reptile Park began as a Tilapia farm in 1977. Baby gators were purchased in 1987 to dispose of dead fish and filleted fish remains. It opened in 1990 to the public so everyone could see the gators. We liked seeing all the gators, but we especially liked seeing all the "Turtly's". Read more about our visit to Colorado Gators Reptile Park. It was nice to get back to the hotel. We were a happy, tired bunch but the "Pickles" still found the energy to play in the hotel's indoor pool for an hour or so. Mr. LH and I eased our sore muscles in the hot tub. Monday morning, we enjoyed another large complimentary breakfast and checked out of the hotel. We would be in the car most of the morning crossing east over the Sangre de Cristo mountains into the Wet Mountain Valley. Our destination was Mission:Wolf. Mission:Wolf is a wolf sanctuary that is open to the public. I discovered Mission: Wolf while researching Westcliffe. Since we were already going to be in and around the Westcliffe area, we thought we could just swing by" to check out Mission:Wolf as well (especially since The Girl is crazy about wolves now, too). But first, we had to get from one mountain valley to another. Instead of going around the mountains, we thought we'd go across them. The route didn't look too bad on the map...however, as soon as we turned off the highway, the road conditions...er...deteriorated. We thought "Surely they'll get better!" They didn't. The van was definitely not made for dirt roads. We got a pretty good idea how bouncy wagons were back in the day. We probably could have driven faster, but it was so bouncy and we were really enjoying the scenery going at a slow pace. The scenery was awesome! 2 hours later (? 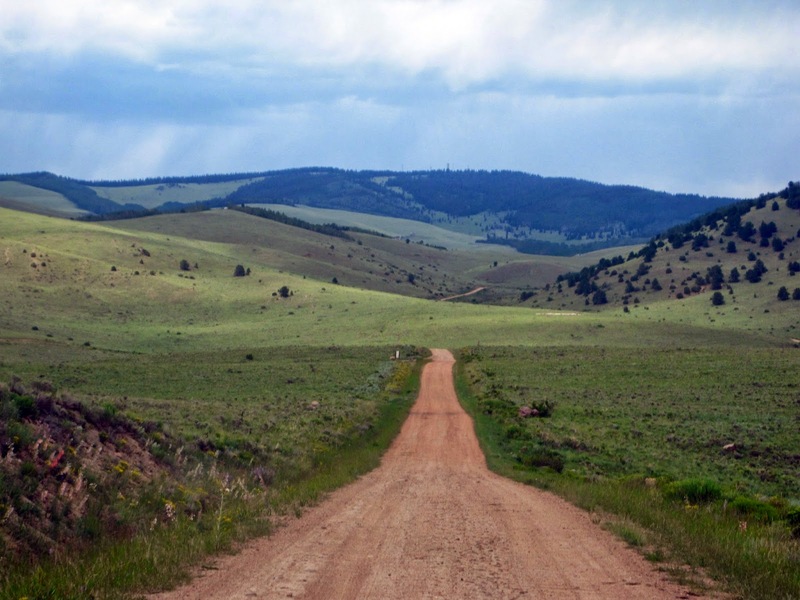 ), we pulled out of the Sangre de Cristo mountains and into the Wet Mountain Valley. But our road issue wasn't over. We crossed 69...one of the VERY few paved roads we've found in the county...and headed farther east to Mission:Wolf. The roads actually got worse. Especially in the San Isabel National Forest area. I'm glad we didn't meet another car coming the other way! Yes, folks...that is a drop-off to the left. I just had to keep my head turned the other way pretending I was searching for wildflowers. We did finally make it to Mission:Wolf. One of the volunteers came out to give us a tour. She was fantastic and spent a lot of time showing us around, telling us about the wolves, their habitats, and their care. We were also able to go in with a larger group to meet some of the wolves face-to-face. This may be the most memorable part of our entire trip! The Boy chose to stay outside of the fence and take pictures. Read more about our visit to Mission:Wolf. Once we got home, we decided we would sponsor a wolf. The Girl chose Magpie this first year. I think Mr. LH wants to choose Zeab next time (he's the huge black wolf in the fence with us). To sponsor a wolf, go to the Mission:Wolf website. It doesn't cost much and you'll get a photo, a membership and a subscription to the Mission: Wolf newsletter. It was hard to leave Mission:Wolf, but we still had to check out the Westcliffe area AND drive all the way back home. Westcliffe is a small town of about 600 (or so) in the Wet Mountain Valley. It sits right next to the town of Silver Cliff which is about the same size. The rest of the county is made up of two mountain ranges (the Wet Mountains and the Sangre De Cristos) surrounding the Wet Mountain Valley. We were in the south-eastern part of it and it was absolutely gorgeous! It wasn't scrubby like the San Luis Valley had been. Well, parts of it were scrubby, but not AS scrubby. However, let me point out that all the roads were dirt. Some were VERY rough. It was difficult in places to drive. This was a beautiful, clear, dry July day. Those same areas could very well be impassable in the winter. There are some things we would have to decide on, like whether we would be happy with limited internet. There is no cable or DSL in the rural areas of the county. This particular neighborhood is solar and wind power only (meaning they're not bringing power lines in). Finding water for a well is not guaranteed and if you find water, the pressure may be WAY less than was city folks are used to. Could we be happy being so isolated? Those are all things to consider. But right now the main thing to consider is...it's still 2 1/2 hours to Denver (at least...and on a good day). That's a long commute - even if it's just once a week. And Mr. LH isn't planning on leaving his job until he retires. With the area sufficiently scoped out for now, we started back towards Denver. It had been a wonderful busy couple of days. A Whirlwind Weekend Getaway. It has been over a year and we're still working our way out of debt. We didn't forgo our Total Money Makeover budget to make this trip. We had budgeted money for our Vail trip but since we didn't go to Vail this year, that money became our vacation money. Even so, we didn't want to use it all. Gas and hotel expenses accounted for the bulk of our budget. We couldn't do anything about gas prices, but we chose an inexpensive (but clean) hotel for a 2 night stay and used our AAA membership to get a lower cost. Food can quickly become expensive on vacations. Since we were just making a weekend trip, we packed a huge cooler with food for a couple dinners (the hotel room had a refrigerator and microwave) and took advantage of the large complimentary breakfast offered by the hotel each morning. We also kept water bottles handy and had a load of snacks in the car. We did splurge on 50 cent ice cream cones one night. The Great Sand Dunes was a wonderful activity that could easily take up the entire day. It was free. The optional sand sled was $18. Mission:Wolf was technically free, though donations are encouraged. The Colorado Gators Reptile Park had a hefty admission price but we knew about it and planned it into our budget. We also used available admission coupons to lower the cost. There were a couple other places in the area we would have liked to have seen if we had the time. Near The Colorado Gator Reptile Park is the UFO Watchtower. This looks to be akin to other "roadside weirdness" tourist attractions but it would have been neat just to see it. In the Wet Mountains is Bishop Castle. I REALLY would have liked to have stopped here! We wound up spending about $350 on our mini vacation. Not bad, though I'd like to get it cheaper next time. Maybe we'll stay at a campground instead of a hotel. I came across a "Colorado For Free" website that I'll be checking out thoroughly.